After the final putt disappeared into the cup, Rickie Fowler waited outside the scoring room at Augusta National. Once again, he was congratulating someone else on winning their first major championship . For Fowler, the wait goes on. This has become a familiar lament for Fowler, who now lugs around the unwanted baggage as the best player without a title in one of golf’s biggest events. He had his best chance yet on a stirring Sunday at the Masters, making six birdies over the final 11 holes — including an 8-footer at the 72nd hole that finished off a 14-under 274 . It’s a score that would’ve been good enough to win most years. But Patrick Reed had one less stroke on his card, claiming the green jacket by sinking a short but testy par putt at No. 18 . 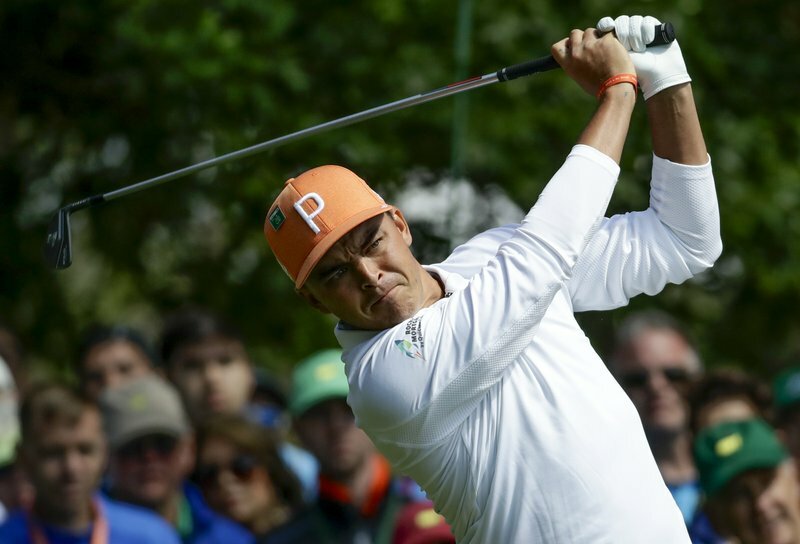 “Glad I at least made the last one to make him earn it,” Fowler said. Jordan Spieth did his part, too, to make Reed earn it. The 24-year-old Texan turned in one of the greatest closing rounds in Masters history, shooting an 8-under 64 that pushed him into the mix after he started the day with a daunting nine-shot deficit. Spieth thought it would be a nice, stress-free day out on the course. Instead, he horned his way into one of the greatest duels this place has ever seen, actually grabbing a share of the lead by sinking a 35-foot birdie putt at the 16th hole . “Are you kidding me,” Spieth mouthed to his caddie. Reed, playing in the final group, answered with a birdie at the 14th. Spieth’s hopes ended at the 18th hole after his tee shot clipped a tree, falling to the ground just 177 yards away. He pulled off two dazzling shots to give himself a shot at saving par. But an 8-foot putt slid by the edge of hole — his only bogey of the day. Spieth sure knows his way around Augusta National, where he won in 2015, finished second two other times, and now has a third-place showing on his resume. His worst performance in five appearances was a tie for 11th last year. Fowler couldn’t resist a little jab at his good friend. “Solo second feels and sounds better than tied for second, so it was nice to edge out Jordan,” Fowler said with a smile. But Spieth, only 24, already has three major titles on his resume. The 29-year-old Fowler is still chasing the first. He’s certainly had plenty of opportunities, most notably finishing in the top five of all four majors in 2014. Fowler now has eight top-five finishes in 31 majors over his career. This one felt different than all the others. Fowler played like a champion on the final day. He went to the last hole with a real shot to win. “I am ready to go win a major, but this was kind of the first major week that I understood that and knew that and felt that,” he said. “I’m ready to go. I’m really looking forward to this year and the three majors that are left. Fowler will need to get off to a better start than he did in Augusta, where he was just 2 under through the first two rounds. He really turned it on over the weekend, surging into contention with a 65 on Saturday before matching the best closing round of his Masters career. He showed his mettle by battling through a tough start Sunday — his first seven holes resulted in six pars and a bogey — but got things going with back-to-back birdies before making the turn. Fowler added four more birdies on the back side, the best he’s ever played with a major title hanging in the balance. It wasn’t quite good enough, but it left no doubt that he’s got the game to break through some day. Someone asked Fowler about his goals going forward.